The Bow Wow Buddies Foundation, a nonprofit dedicated to awarding grants of up to $2,500 to cover the cost of unplanned, necessary medical care for dogs in need, gave a new 'leash' on life to 40% more deserving dogs in 2017. By year end, the Foundation granted over $150,000 to provide 89 dogs with necessary medical attention. To kick off 2018 and to continue the strong momentum of helping even more sick and injured dogs in need, visit www.bowwowbuddies.com/donate. The organization is the 501(c)(3) entity of Camp Bow Wow®, the nation's largest and leading Doggy Day Care and Boarding franchise. The Foundation focuses efforts on dogs who are placed in shelters/rescues, as well as on families facing hardships. Through its contributions, the nonprofit provides a lifeline to ease financial burdens to keep dogs happy and healthy in their current homes or helps ensure they will find a fur-ever family. "In 2017, we saw the Bow Wow Buddies Foundation gain unprecedented traction as it received support from our franchise owners' Camps throughout the country as well as through clients and community members," said Erin Askeland, Training & Communication Manager for Camp Bow Wow and the Bow Wow Buddies Foundation. "Local initiatives and events hosted at Camps, in addition to dedicated patrons such as ten-year-old Hannah Okel of Waukesha, Wisconsin who asked for donations to the Foundation in lieu of birthday gifts, prove we've built a strong network of those who are passionate about fundraising and supporting the Foundation's cause." One of the many deserving dogs helped by the Bow Wow Buddies Foundation in 2017 was Cricket, a 3.5-month-old Pit Bull mix. 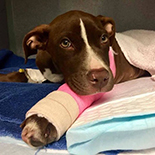 She fell out of a three-story window, sustaining injuries requiring amputation of her front leg and a femoral head and neck osteotomy. After receiving this critical prognosis, Players for Pits, an Illinois-based 501(c)(3) no-kill rescue, placed an application with the Bow Wow Buddies Foundation seeking immediate assistance for Cricket's surgeries. By being awarded this grant, Players for Pits was able to rehabilitate Cricket with the best quality veterinarian care to prepare her for adoption once she is completely healed. Allowing this puppy to avoid living in extreme pain is one instance which exemplifies the important role the Foundation plays for rescues that would otherwise not be able to provide the needed medical funds. In 2018, the Foundation will continue to engage its franchisees, clients and community members through meaningful fundraising programs. The first one will kick off with Valentine's Day, during which Campers can share the love with their furry friends by sending a card to other Campers for a donation to the Foundation. Through such fundraisers, Camp Bow Wow plans to sustain its strong momentum and help provide additional aid for dogs, aiming to support more than 100 dogs throughout the year. For more information about Camp Bow Wow, the Bow Wow Buddies Foundation, to find a location near you, or to become a franchise owner, please visit www.campbowwow.com. To support the Foundation and to help dogs in need, please visit www.bowwowbuddies.com/donate.